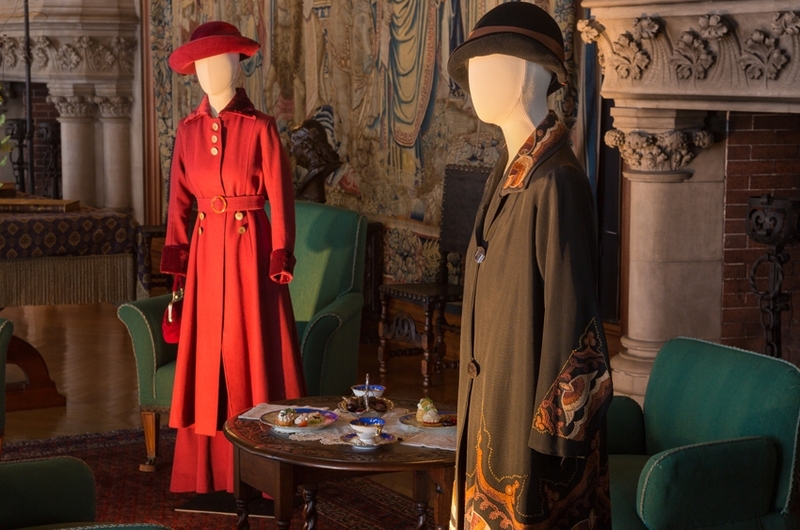 There’s a special exhibit going on at the Biltmore Estate right now, and for all of the Downton Abbey fans it is wonderful. Even more so for those that know what it takes to use needle and thread to create wearable art. Wearable art is precisely what I saw there. Gorgeous beading and exquisite hand embroidery adorn these dresses worn by the actors. I adore the hats, too! Pictures just do not do them justice. I would have loved to get some close up photographs, but sadly, photography is not allowed inside the Biltmore House. The next best thing is to show you some of the press release photos from Romantic Asheville and Biltmore Estate. You can click on those links to see more pictures of the costumes. 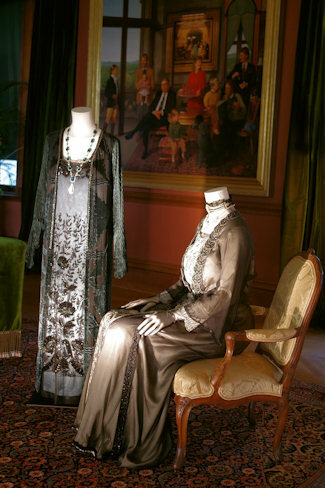 Below, the Dowager’s dress is in the foreground, with Lord and Lady Grantham costumes behind. All the costumes were breathtaking. Some of them you can just see the actor wearing. Like the purple ensemble above, can’t you just ‘see’ Maggie Smith wearing that? 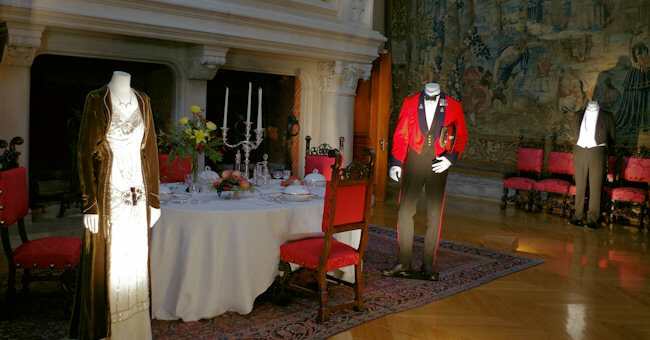 Displays are set up many of the rooms at Biltmore House. 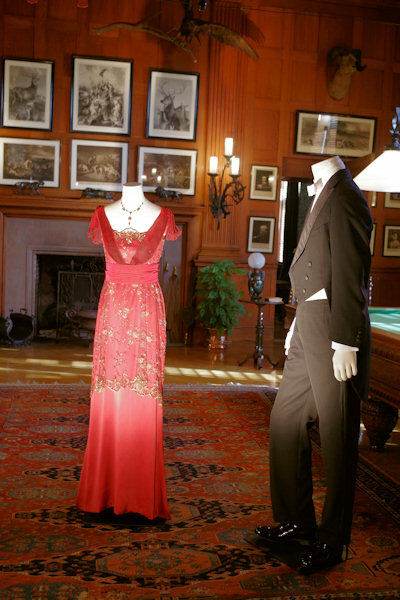 Lord and Lady Grantham costumes are set up in a dining room for dinner, with Mr. Carson’s evening dress on the right. It was interesting to learn that even the servants had day wear and evening dress. 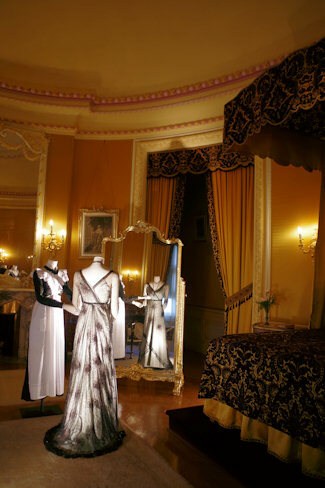 There were lovely dresses in the bedrooms, sitting rooms, library, and billiard rooms along with maid and servant’s costumes in various rooms. There was even Mrs Patmore’s dress and Daisy’s costume in the kitchen. You just have to see them to understand how detailed they are, the amount of handwork is amazing. The collection is on a tour, coming to this area from the Winterthur museum. I don’t know where it goes next, but if it comes near you, go see it. For those of us in the Western NC area, the exhibit goes until the middle of May. Be prepared for some long lines, it is very popular! The dress on Maggie Smith above was in the gift shop. 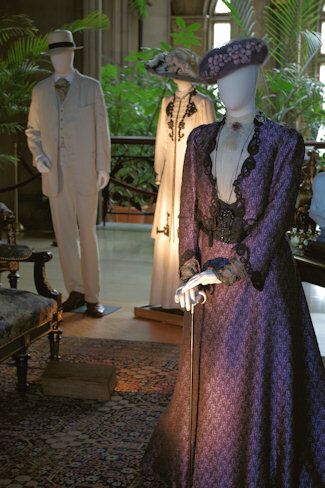 The Biltmore House produced a book of all the costumes, pictures with the actors wearing them, with bits of history and social conventions of the time. It was the perfect remembrance of the day, pages of history and evolution of fashion to savor at home. Fashion was heavily influenced by the war years of the first world war. I thought it was so interesting to read how the use of metal for war projects influenced the demise of the corset, and how working women began wearing shorter skirts to keep their hems clean particularly in the hospitals. So much more is there, and it is fascinating. I almost bought the tote bag that said “I spend Sunday nights at Downton”. The final season is filming now, and will air in January 2016. I really wish I didn’t have to wait that long! 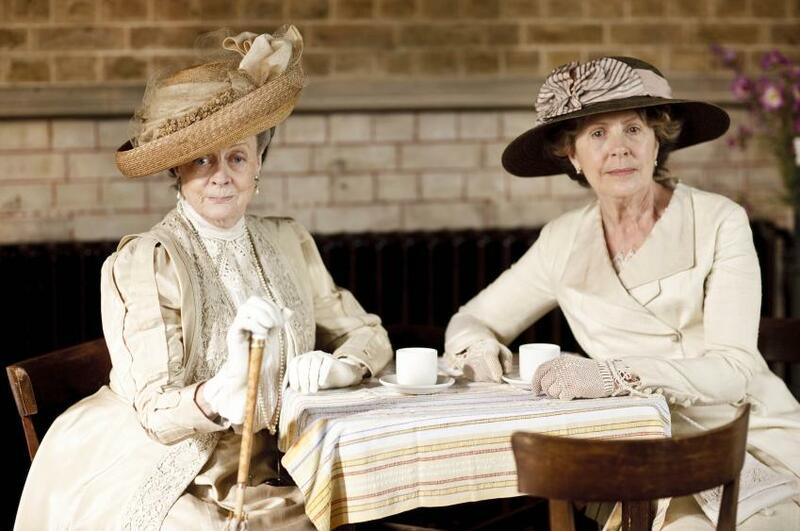 Are you a Downton Abbey Fan? wish I could have gone with you! Yes, love the clothes. Edwardian were so elegant, even the servants’ uniforms. But oh, the corsets! Then you get the frumpy 20’s and they only looked nice on Twiggy types, and sewing those drapey bias cut fabrics must have been a nightmare without good walking feet! Still, lovely to look at….. I miss the millinery shop they used to have at Disneyland years ago, would always go for the lovely brims and feathers! no longer there. I love the clothing from that area but never watched the show. I think when it first came out my husband was watching a show on a different channel and I didn’t even know about it. By the time I did I was so far behind I never bothered to try watching. Thanks for sharing the wonderful photos! Thanks for sharing all the clothing, and history. Abby is one of my favorites, also, Mr. Selfridge. I lived in Asheville very near the Estate for many years and learned and enjoyed so much of the family history and people connected to it. My Uncle was employed at the Estate as a bookkeeper for many years. I also enjoyed the little Biltmore village and the beautiful Cathedral built by Mr. Vanderbilt. 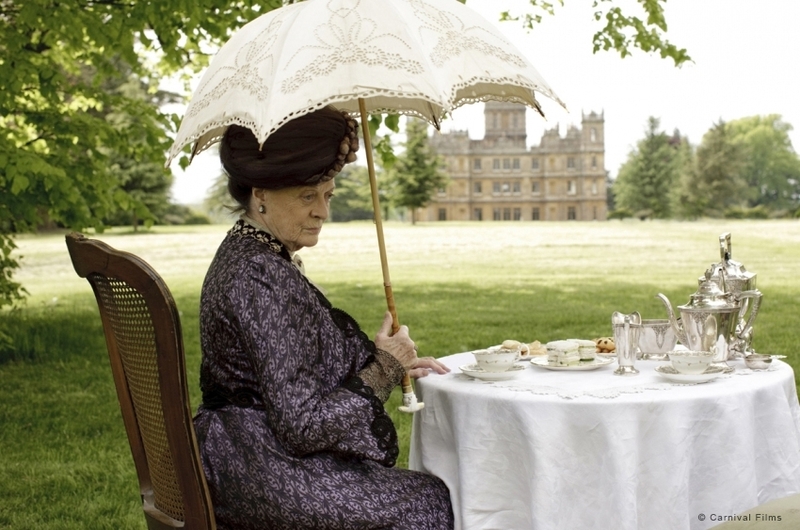 Absolutely LOVE Downtown Abbey (have always been a history buff – love reading historical fiction and watching movies/TV). What a fantastic exhibit to be able to see, am green with envy!